I just got around to reading this book I bought for a song at a remainders bookstore in Chatswood Chase last year. 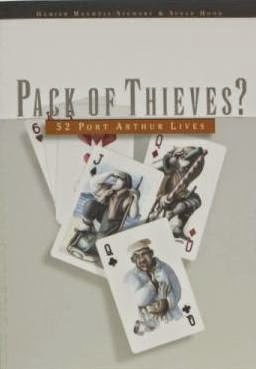 Pack of Thieves by Hamish Maxwell-Stewart & Susan Hood relates the stories of 52 convicts who served time at the Port Arthur penal settlement in Tasmania. While it is well written I found it a bit boring and repetitive after I had read the stories of twenty or so convicts. If one of them had been an ancestor of mine I would have been enthralled. What makes this book valuable is its excellent glossary and bibliography. I recognise the cards on the cover, we were handed one when we visited Port Arthur in February. I wonder if the prisoners are the same as the ones on the walls in the museum. I should imagine they are Jane. I havne't been to Port Arthur for around ten years. Perhaps it's time to visit again. I purchased this book at Port Arthur a few years ago.